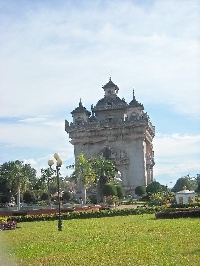 The Patuxay Monument is also referred to as the Arc de Triomphe of Laos and is located in the city centre of Vientiane. Standing in front of this good looking structure it might feel for a seconf like you're in the Paris of Asia but as soon as your eyes drift of to the ceiling of the Patuxay you'll notice all the Lao details. If you take a closer look you can see all kinds of kinnari figurines painted in bright colours on the ceiling of the arc which obviously aren't very french and a typical detail of Lao style buildings. This all results very logical once you know that the Victory Gate was build to commemorate those who lost their lives in the war against the French. From on top of the Patuxay Monument you can get a great view of Vientiane and take some nice pictures of the hectic street panorama beneath. The Patuxay Monument of Vientiane is located about 5 minutes by car or tukt tuk from the town city and adjacent to the Patuxay Park. Most of the tourists combine a stop at the arc with a visit to the Golden Temple of Vientiane as both attractions are located on the same road. Did you enjoy The Patuxay Monument: Gate of Triumph and have you been on a holiday in Vientiane, Laos? What to do in Vientiane: Its a good idea to visit both Patuxay Monument as the Golden Temple because they are located on the same road.